Winter is a breathing space for the garden and gardener, but when for days on end the sun never shines, some flower power does wonders to lift the flagging spirits. The garden wouldn’t be the first place that many people look to for some winter cheer, but for the keen gardener the season still has plenty of charm. Take for example a bright morning when the twigs of skeletal trees are painted with hoar frost. The scene is invigorating not dreary, but when a smattering of winter flowering plants are included the landscape becomes even more beguiling. Introduced in 1844 by Robert Fortune, Jasminum nudiflorum (winter flowering jasmine) must be grown more than any other winter flowering plant. Its popularity is richly deserved on account of the heart-warming display of rich yellow flowers produced abundantly on leafless branches from November through to the end of February. A warm wall (either south or south-west facing) is the ideal place to plant a Chimonanthus praecox (winter sweet). This shrub is a class act. It grows, albeit slowly to 2.5 meters tall and 3 metres wide, its deliciously fragrant small, 4cm wide flowers which appear on the naked winter stems are pale yellow with a purple heart. Garrya elliptica (silk tassel bush) is an evergreen shrub often grown against a wall. Clothed with dark olive leaves its crowning glory arrives each winter in the shape of long, drooping clusters of soft grey-green catkins. The longest of these, which reach 30-40cm, belong to the male cultivar ‘James Roof’. In summer the Garya is boring and dreary, but you can jolly it along by planting it with a summer flowering clematis like ‘Miss Bateman’ a large single-white flowered cultivar with red anthers. For January/February colour try combining aconites and snowdrops as a ground covering carpet beneath a witch hazel. 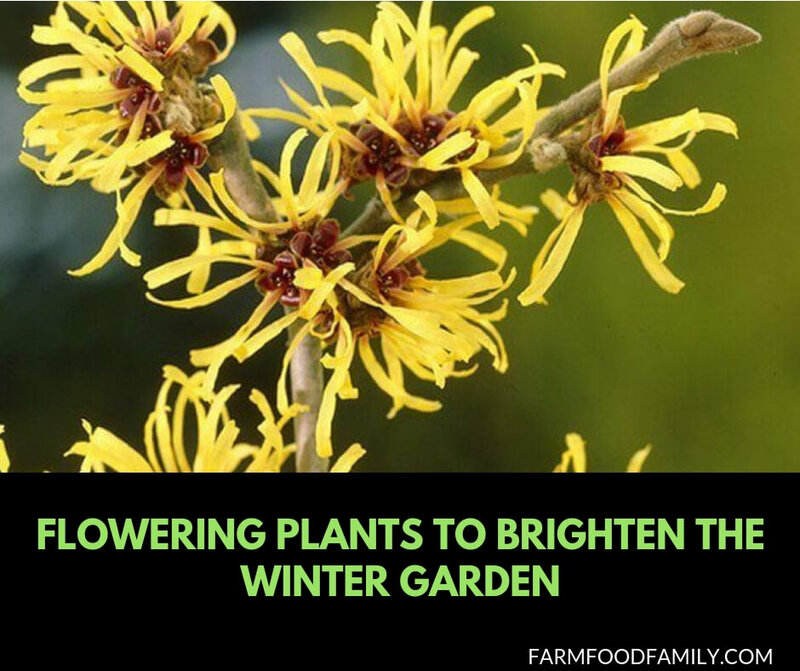 Hamamelis mollis ‘Pallida’ has clusters of large, sulphur-yellow, frost resistant, spider-shaped blooms. At the same time the vigorous, rather sprawling Lonicera x purpusii ‘Winter Beauty’ (winter honeysuckle) carries small, sweetly scented white flowers. For fragrant winter flowers borne at a height which doesn’t require the admirer to bend then Mahonia x media ‘Bucklland‘ with its long cylindrical spikes of tiny, scented, (rather like lily of the valley), yellow flowers is hard to beat. Cultivars of Erica carnea (winter flowering heathers) including ‘Springwood White’, ‘Springwood Pink’, ‘Myertoun Ruby’ , and ‘Winter Beauty’ can be relied on to beguile even in the harshest weather with their tiny scented spikes of bell like flowers right through to spring. Dark December and January days may be lifted by white and gold flowers of Helleborus niger (Christmas rose). Helleborus x hybridus cultivars carry saucer-shaped flowers from mid-winter to mid-spring in a range of colors including white, purple, yellow, green and pink. Prunus x subhirtella (Higan cherry) is a spreading, deciduous tree with bowl-shaped white or pink flowers 2cm across and borne in clusters from autumn to spring. There are several cultivars of the specie, but ‘Autumnalis’ with semi-double pink-tinged white flowers is one of the best. A little planning and the selection of some cheery winter flowering plants from the garden center can give the feel good factor a real boost in the depth of winter.